Nvidia will work with automotive supplier Bosch to mass-produce self-driving car systems using the upcoming Xavier chip. Bosch provides automotive parts and in-vehicle technologies used by automotive companies worldwide. For example, Bosch supplies sensors and automotive parts to Tesla's cars with self-driving technology. Nvidia last year announced that its Drive PX board product line will use the powerful Xavier chip, but didn't provide a shipment date. Bosch will be one of the first companies to develop a computer using that board. The joint development project was announced Wednesday. Nvidia packs parallel programming and machine learning software development platforms into the Drive PX boards. Bosch will also use those technologies with the car computer, and it will supply the end product to car makers. That's a positive development for Nvidia, which is competing with car and chip makers in the emerging autonomous car market. Intel this week made a big splash, saying it would pay $15.3 billion to acquire Mobileye, which develops sensors, chips and software for self-driving cars. Nvidia's self-driving car technologies are mostly homegrown, and the chip maker is working with a wide range of car makers including Volvo, Audi, Mercedes-Benz and Ford. The Drive PX with Xavier will be the third model in Nvidia's car computer lineup, designed to allow cars to recognize images and quickly draw up accurate maps. That will help develop self-driving cabs, in which accurate point-to-point driving is paramount. The Drive computers are also mean to help avoid collisions and make smart driving decisions. Nvidia has already developed a self-driving car based on the first Drive PX model that can change lanes, stop at signals, ride highways and go from one point to another by drawing up maps. 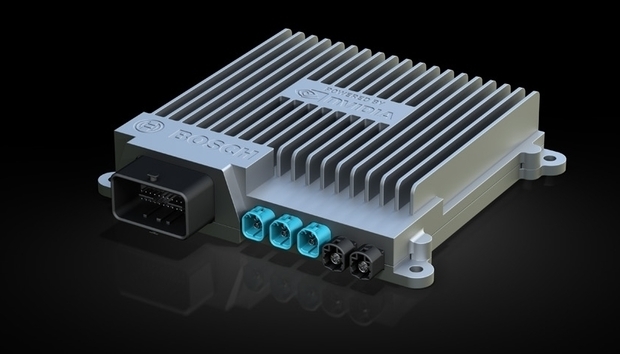 The Drive PX systems collect data from GPS, radar, lidar, cameras and other sensors to make driving decisions. The computer being built by Bosch and Nvidia will be like a supercomputer in a car. Nvidia has said that its Drive PX computers will ultimately have the ability to recognize everything in sight as a car is moving, which will help autonomous vehicles make driving decisions. The delivery date for the computer made by Bosch and Nvidia wasn't announced. But getting a big car parts supplier is a good way for Nvidia to get its technology into autonomous vehicles. Intel is also working with car parts supplier Delphi in a similar fashion.